All 33 of Burnley's claret and blue shirts over the past 100 years went on display and here we show numbers 26 to 30 that were worn by the team from 2002 to 2007. 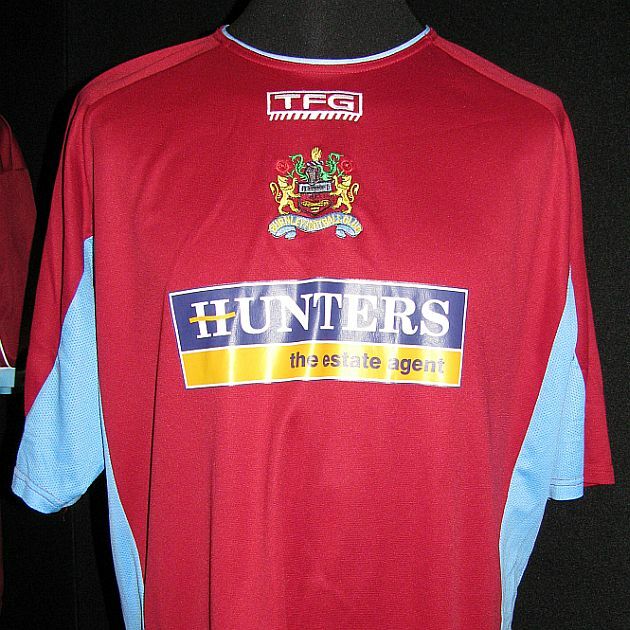 The 2002/03 shirt, this time using the TFG logo rather than the previous Super League, saw the club badge and the manufacturers logo placed in the centre of the shirt rather than on the left and right hand sides. This meant the shirt sponsor Lanway's logo was considerably lower on the shirt than previously. 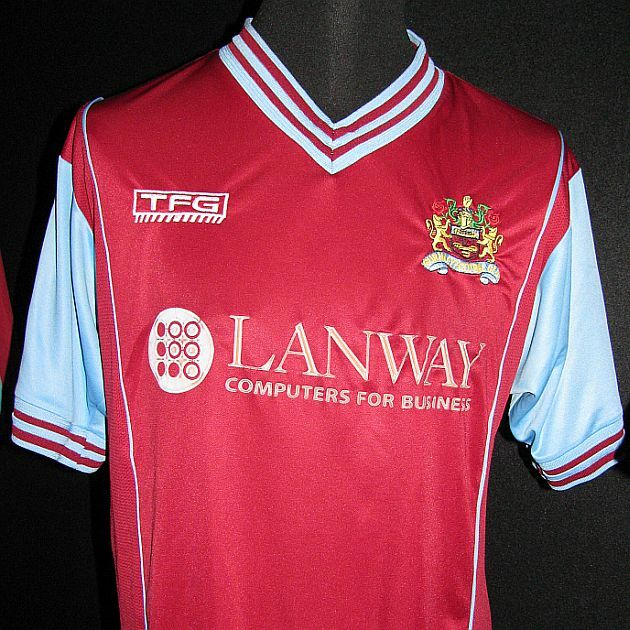 The shirt incorporated a blue collar with claret trim, the first shirt with a collar since promotion in 2000. It became the first Burnley shirt to be used in an FA Cup quarter-final for 20 years, a day that ended miserably with a poor performance and result at Watford.. 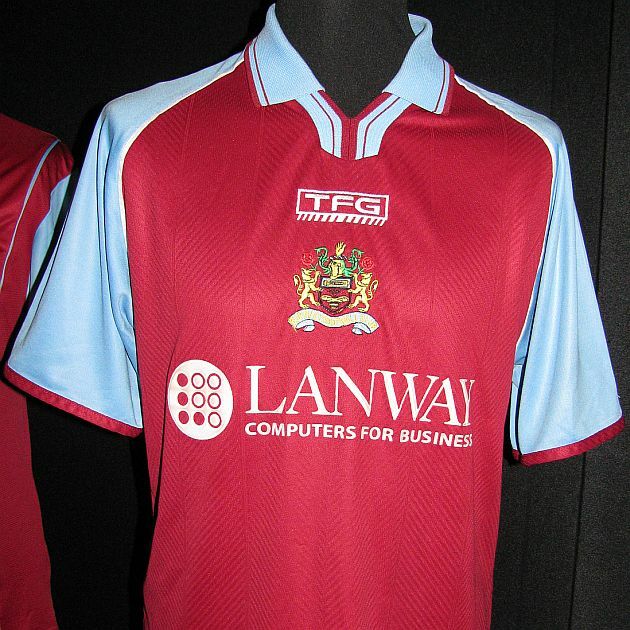 The new shirt for the 2003/04 season reverted to the blue V neck, but one with two claret bars. The cuffs were similar making the shirt, for the traditionalists, look more West Ham than Burnley. There were two versious of this shirt with the one shown above used at home. Lanway, in their final season, were sponsors of the home shirt only. The away shirt sported the name VK Vodka. A new season, a new sponsor and a new era for Burnley FC. Stan Ternent had left the club after six years to be replaced by Steve Cotterill and for his first season the club had a new shirt sponsor in estate agents Hunters. In terms of design for our shirt, this had to be the worst ever sponsor with a big blue and yellow patch across the front. Again TFG, in their last season, had their logo and the club badge placed centrally, whilst the shirt almost looked unfinished without a collar. It was a round neck with just a thin blue piping. 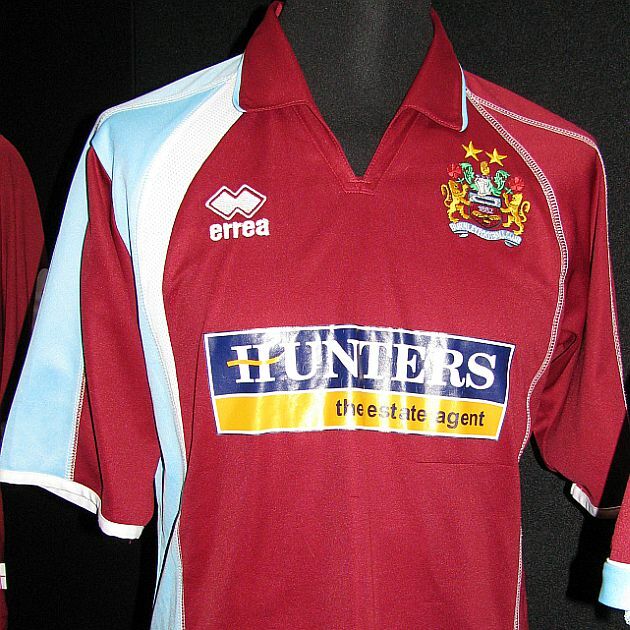 The 2005/06 season saw the arrival of Errea as the new shirt manufacturer. 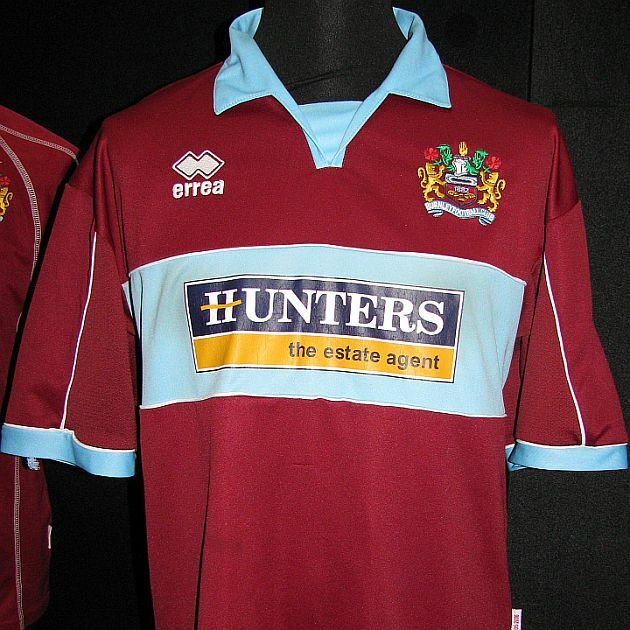 The North Italian company had produced shirts previously for other English clubs, including Middlesbrough, and our shirt was a claret and blue replica of Middlesbrough's home shirt from the previous season with a thick blue horizontal bar across the front which at least made the Hunters logo look not quite so bad. The shirt included a blue collar and it saw the club badge return to the left hand side with the Errea logo on the right. Gone was the blue bar for the 2006/07 season but this shirt included two totally different shoulders and sleeves. The left was claret whilst the right featured claret, blue and white. It was a V neck shirt with a claret collar and again with the club badge on the left, this time with two gold starts above it to recognise our winning the league championship twice. Thankfully, that idea was discontinued after one season. It also proved to be the last shirt manufactures by Hunters.